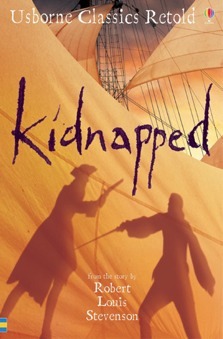 A faithful retelling of Robert Louis Stevenson's classic story of daring, intrigue and danger. Ideal for encouraging young readers to pursue an interest in literature. It was a fine, summer morning as I locked the door of my father’s house for the last time. The blackbirds were whistling among the garden flowers, and the dawn mist had started to lift and die away. The church minister, Mr. Campbell, was waiting for me at the gate. “Have you had any breakfast, Davie?” he asked kindly. He looked around for somewhere to sit and, spying a flat-topped boulder by the side of the road, led me over to it. The sun was beating down on us now, and I could smell the scent of the wild flowers and the heather, drifting down from the open country at the top of the valley. I sat next to him on the rock and he took my hand. “When your mother was dead,” he began in a serious voice, “and your father himself was dying, he gave me a letter, which he said was your inheritance. ‘Once I am gone,’ he told me, ‘and the house has been emptied, give my boy this letter and send him off to the House of Shaws, in the district of Cramond. That is where I am from, and it seems right that my son should return there.’ That was his request, Davie. by my son, David Balfour. He hugged me, then held me at arm’s length, studying me with a sad expression. At last he cried “goodbye” and set off back to the village at a run. It was a strange sight to watch the minister jogging away from me, but I realized he was unhappy to see me go, and had to get away before his emotions got the better of him. I knew I should feel sad too, but I was longing to meet my new family. After scolding myself for such ungrateful thoughts, when I was saying farewell to my only friend, I waded the ford and climbed the side of the valley. Out on the drover’s road that runs wide through the heather, I turned and took my last look at the church of Essendean, the tall, wind-curled trees around its graveyard and the rowan trees with their bright red berries, marking the spot where my mother and father rested. Then I was on my way. Two days later I spotted Edinburgh, with thousands of chimneys smoking like a forest fire, high upon a ridge that ran down to the sea. There was a flag on the highest castle tower and a flotilla of ships bobbing around by the docks. I stared at this scene for hours, my country eyes amazed by the new sights of the ocean and the city. Coming down onto the road for Cramond, I saw a regiment of English soldiers, marching in perfect step to a tune played on the Highland pipes. At the head of the column was an old, red-faced general, who rode a grey horse. The gold buttons on their red uniforms glittered in the sun, and the pipe music made me want to start marching myself. I asked the people I met for directions to “The House of Shaws”. But the question surprised everyone. At first I thought it must be that my dusty, travel-worn appearance was so unlike the grand tradition of that name, but I soon began to wonder if there might be something strange about the Shaws themselves. I decided to pose my questions more carefully. Seeing a man driving down the lane in a cart, I asked him if he had heard of the house. “Is it a large place?” I continued. “But what about the people that live in it?” I tried. “But, there’s Mr. Ebenezer,” I said, my voice wobbling a little. “I was told I might be able to get a job there,” I lied, still hoping for more information. If it hadn’t been two days walk back to the cozy fireside of Mr. Campbell, I might have turned around, then and there. But I knew I had to go on and discover the truth for myself, and deliver my father’s letter. Towards sundown I saw a woman in a ragged, black cloak, trudging down a slope. Despite the sour expression on her face, I asked her if she knew the House of Shaws. Silently, she led me to the summit of the hill she had just descended. The next valley was a collection of pretty fields and low hills, specked with streams and clumps of woods. In the middle of the plain was a huge house, that looked a bit more like a ruin than a place of residence. There was no road running up to it, no smoke from the chimneys, and no garden that I could see. “That is the place,” she spat at me. She was trembling with a sudden anger. “Blood built it,” she cried, “blood stopped the building of it, and blood shall bring it down.” She waved her fist in the air. “I curse the laird and his estate. I curse his house, his stable, and every man, woman and child that goes near the place.” She turned and was off on her way. I stood there, shocked, my hair standing on end. In those days, people still believed in witches, and after hearing her terrible curse I was shaking so much my teeth chattered. I rested on the hill, not sure if I should retreat or advance. At last, I saw a tiny line of smoke curling from one of the chimneys. It was hardly more than a puff, but it proved there was some life in that old pile of stones. So, I went down the hill along a faint track that meandered toward the house. It was truly a beautiful valley; streaked with hawthorn bushes full of flowers, sheep roaming in the fields and a flurry of birds in the sky. But the closer I got to the wreck of the house, the drearier it seemed. Where the upper stories should have been, I could see open staircases and piles of stones that showed the builders had left before completing their work. Most of the windows had no glass in them, and bats flew in and out of the rooms like bees around a hive. I stepped forward cautiously and, over the murmur of the wind, I heard the clatter of dishes and a dry, rasping cough. But there was no sound of voices - not even the bark of a dog. The main door was tall and studded with old rusty nails. I knocked once, and the house fell into dead silence. A whole minute passed and nothing stirred except the bats fluttering around my head. Again I knocked. By now, my ears were so used to the quiet, I could hear the faint tick of a clock, deep inside the house. But whoever had been coughing now kept completely still and must have held his breath. I was in two minds about whether to knock again or give up, but my anger got the better of me. I started raining kicks and punches on the door, shouting out for Mr. Balfour to show himself. Suddenly I heard the cough directly above me and I jumped back from the door. I could see a man in a nightcap, and the black muzzle of a huge gun pointing straight at me. “It’s loaded,” said a thin, creaking voice. “Put it down on the doorstep and clear off,” said the man, crouching behind his gun. “Introducing who?” the voice asked. I heard the gun barrel rattling on the windowsill, and thought I saw the nightcap bob up and down, as though the man was so shocked he was shaking violently. “Is your father dead?” he managed to say. I was too surprised by the question to give an answer. “I see,” he resumed, in a crafty voice. “He must be dead. That’ll be what brings you beating on my door. Well, Master Balfour,” he said after a long pause, “I’ll let you in.” And he disappeared from the window. There was a loud rattling of chains and bolts, and the door was slowly opened and shut behind me as soon as I had passed through. “Go into the kitchen and don’t touch anything,” ordered the voice from the shadows. I groped my way into a large room. The firelight showed me the barest habitation I had ever lain eyes on. There were some dishes on a shelf and a table set with a bowl of porridge and a small cup of beer. That was all there was in that huge, stone-walled room, except for a few padlocked chests. As soon as he had fastened his chains around the door, the man came through to join me. He was a mean-looking, stooping, wax-faced creature, aged somewhere between fifty and seventy. He wore a rough nightgown over a crumpled shirt. I couldn’t guess when he had last shaved, and his fingernails were long and yellow as corn. But what distressed me more than his appearance was the way he stared. He couldn’t take his eyes off me, but didn’t dare look me straight in the face. I guessed he was an old servant who had been left in charge of the house while its owner was away. “You know my father’s name?” I gasped. I was so disappointed by this news that I almost burst into tears. But I controlled myself, handed him the envelope and sat down to poke at the bowl of cold porridge in disgust. My uncle went over to the fireplace and examined his letter carefully. “Do you know what’s in it?” he asked, when he had finished his inspection. “There’s a wax seal on it, isn’t there?” I asked, annoyed that he thought I might have opened a private note. “No, I mean, what other hopes did you have?” he asked slyly. I watched him spooning the porridge between his thin, pale lips and realized he was still scrutinizing me. Our gaze met only once, when he thought I was staring into the fire and I turned suddenly. No thief caught with his hand in a man’s pocket could have looked as guilty. But there was something else I discerned, from studying his expression. He was scared of me. “Has your father been dead a long time?” he asked suddenly. Uncle Ebenezer seemed more cheerful after we’d had this conversation. I couldn’t be sure if he was upset to hear of his brother’s death or if it had been the arrival of a stranger that had troubled him, but perhaps I had judged him too quickly. He came up behind me and gave me a slap across the back. To my surprise, he didn’t light a candle or a lamp, but started off into a dim passage that led away from the kitchen, feeling his way up a flight of steps. It was so pitch-dark I couldn’t see where I was putting my feet. I stumbled after him and when we reached the landing he guided me into a room. And before I could answer he had closed the door and locked me in. I stood there in the blackness, not sure if I should laugh or cry. The room was as cold as the bottom of a well, and the bed (when I managed to find it), nearly as damp. By good luck, I’d brought my things up with me from the kitchen, and the cloth I’d used to make my travel bundle served as well to make a snug bundle of me. And then, despite all the strange events of the past two days, I fell into a heavy and dreamless sleep. If translation is a poetic and literary act, so too is the re-telling of a great tale and these stories are reworked in accessible, rich and rewarding ways... At £4.99, if this book switches one child onto reading Stevenson’s text, that’s got to be money well spent.